With warmer weather quickly approaching, summer vacation planning is in full swing. Social media has incredible potential to inspire and impact travel plans. In fact, 52% of Facebook users said friends’ photos inspired their travel plans. This is probably due to the fact that recommendations from friends remain the most credible form of advertising. 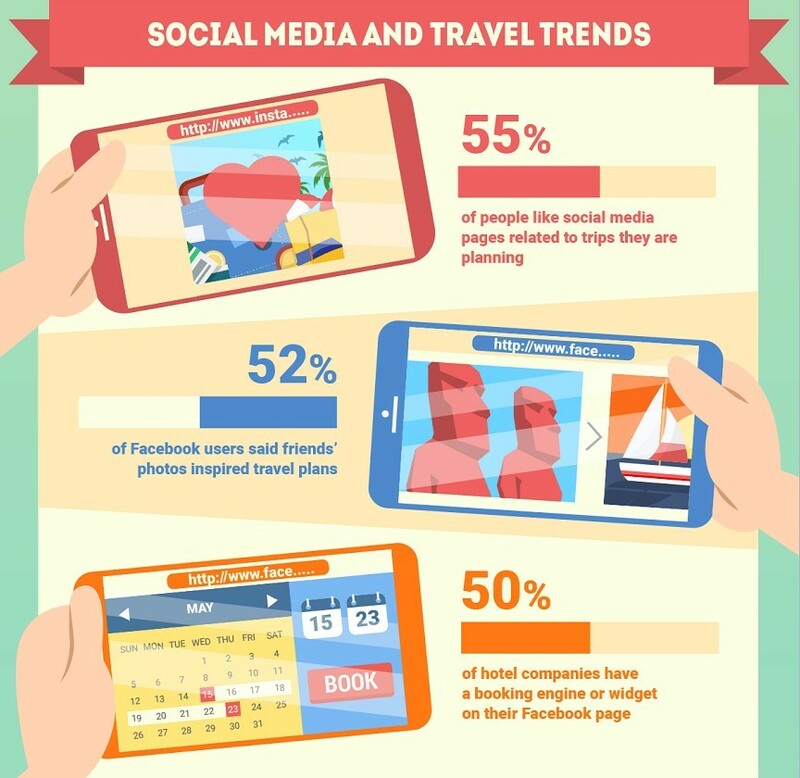 In addition, social media is extremely valuable for travel brands looking to engage travelers. An estimated 55% of people like social media pages related to trips they are planning, and travel marketers have capitalized on this trend to cash in. Plus, about 50% of hotel companies have a booking engine or widget on their Facebook page to make it easier for people to find their hotel and book a room. Recognizing the importance of social media for travel planning, Facebook recently introduced City Guides, a new feature in their mobile app that displays personalized travel recommendations based on where your friends have visited and local attractions. Users can click individual cities to see specific places friends have visited, such as hotels, restaurants, attractions, and other businesses. The same feature also allows you to see a list of famous landmarks, tourist attractions, and scenic destinations. And you can bookmark places in a “saved” section at the top of a city’s page. City Guides combines the credibility of recommendations from friends with helpful data from users to dive into the tourism market. In addition to Facebook, Google also launched its “Google Trips” app last year to help travelers organize all of their trip information in a single location. 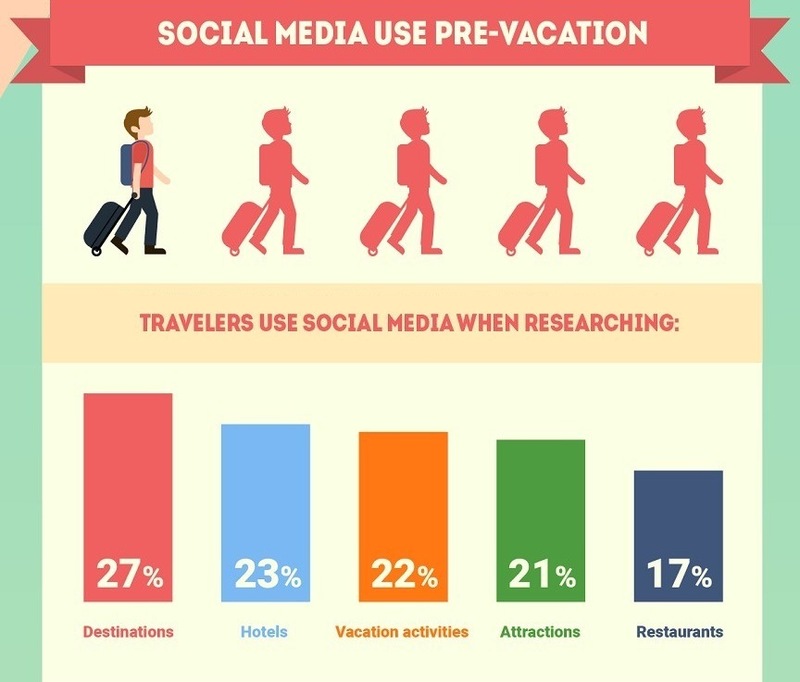 To gain more perspective on the intersection of travel marketing and social media, let’s take a look at how people use social media before, during, and after vacation. 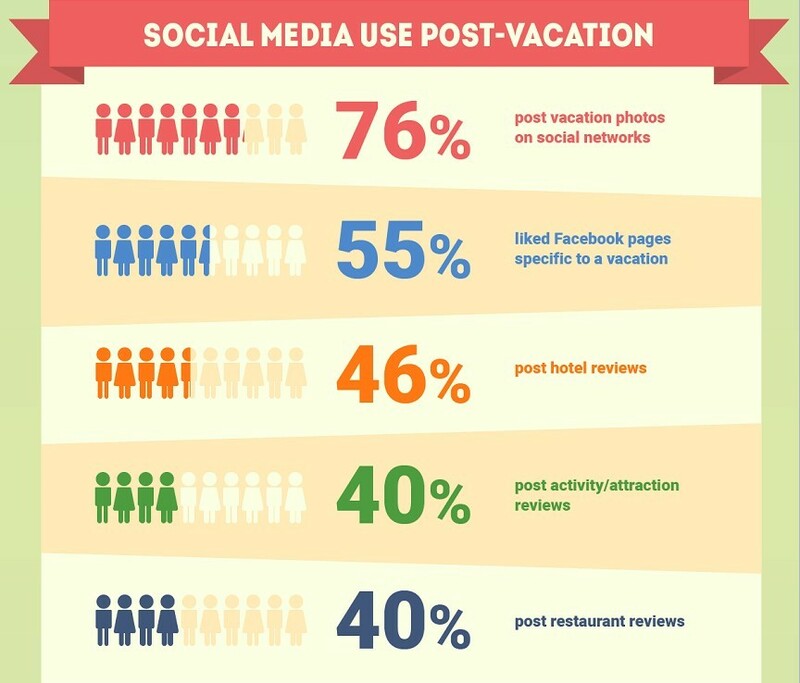 Just how valuable is social media for vacation? 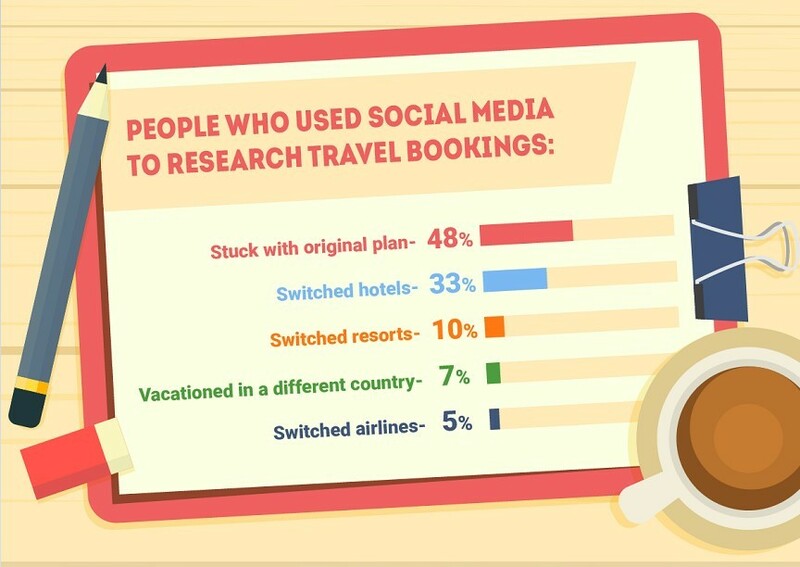 Only 48% of travelers stuck with their original plan after researching on social media. This means that by maintaining a presence on key social media platforms, your travel brand has a significant opportunity to influence users’ travel plans. But what happens after travelers book their trips? After hopping on a plane and arriving in paradise, travelers are ready to relax and unplug, right? 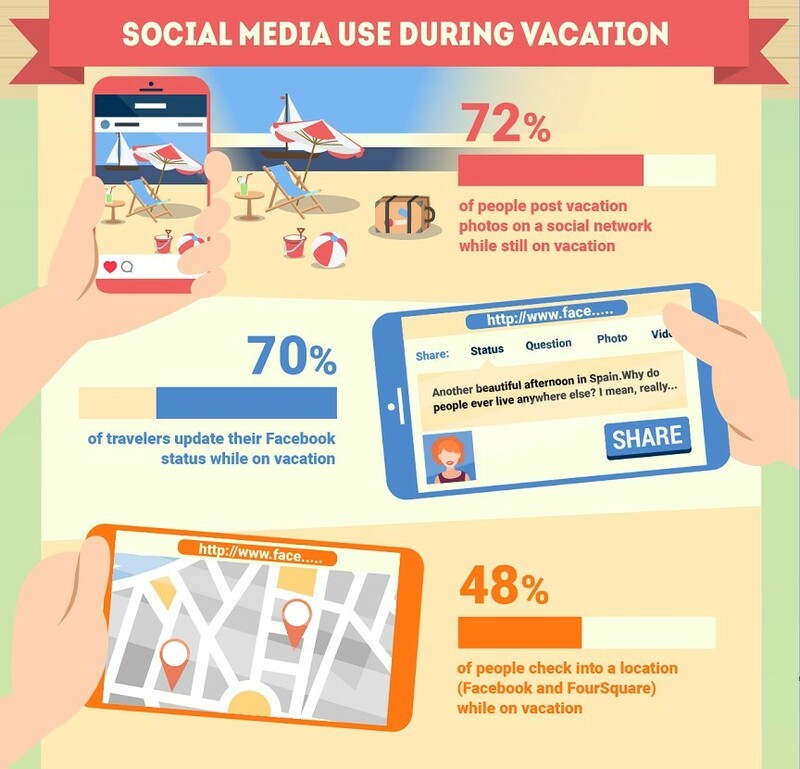 Research shows that people continue to use social media while on vacation. In fact, 72% of people post photos on a social network while still on vacation. 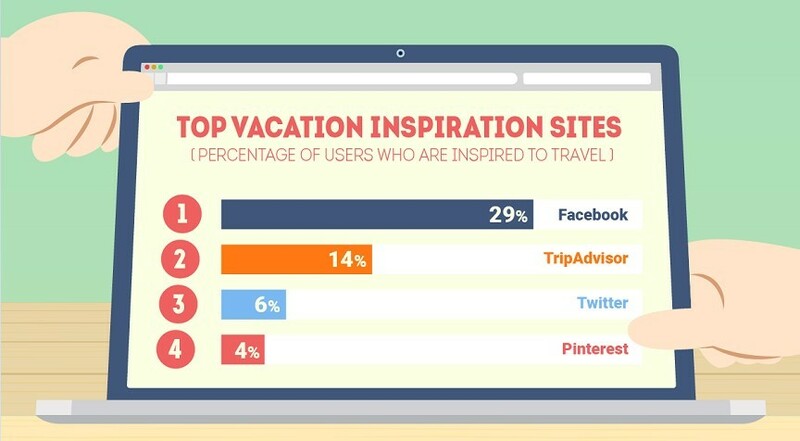 On top of that, 70% of travelers update their Facebook status while vacationing. Travelers also use social media to interact with travel brands during vacation. According to J.D. Power, 67% of consumers have used a company’s social media for customer service. 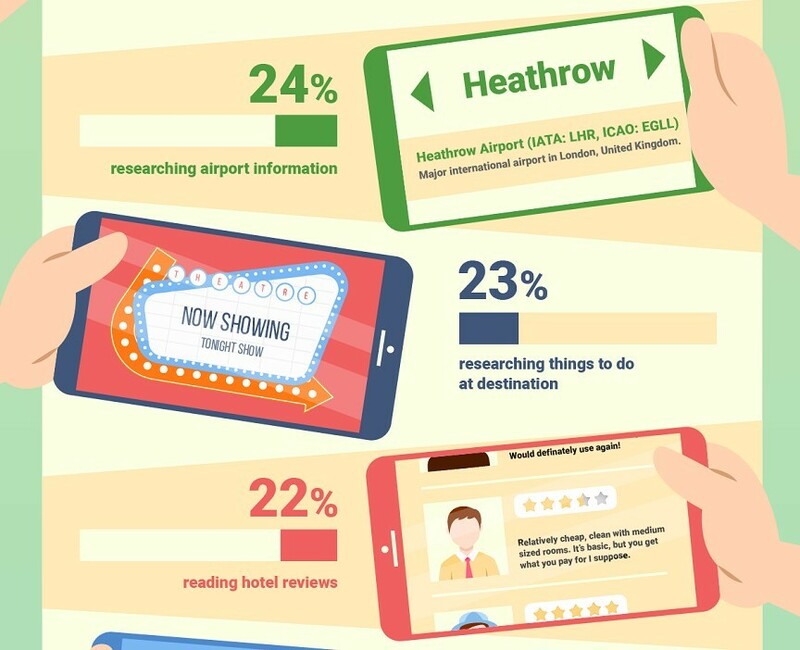 A Twitter study showed that travelers spend more money with brands that quickly respond to questions on social media. Since travelers expect prompt responses from brands on social media, it’s important for travel marketers to create guidelines for responding to questions and complaints. This can help inspire customer loyalty and encourage travelers to share your brand with their friends and family. After returning from vacation and cleaning the sand out of their suitcases, travelers continue to use social media. 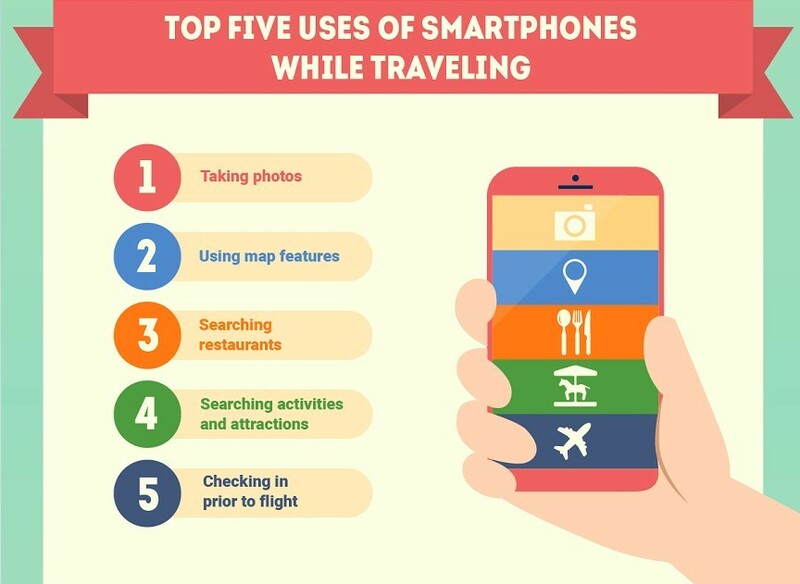 And 76% of people post photos of their travels on social networks after a trip. And where do friends and family turn when planning their next vacations? Your post-vacation feedback and recommendations. We just came full-circle, people! 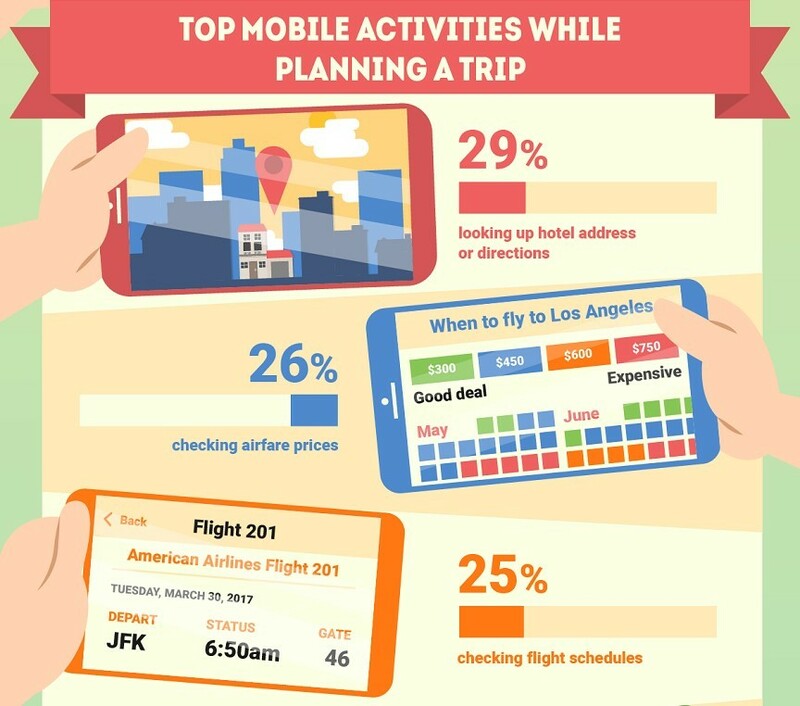 Finally, let’s take a look at how mobile technology impacts travel. 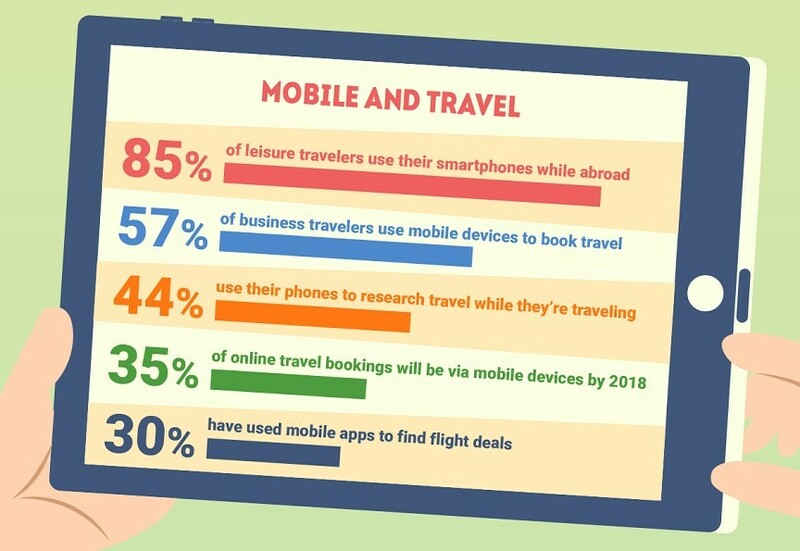 Mobile technology makes it easier than ever to research and book trips on the go, and 85% of leisure travelers use their smartphones while abroad. 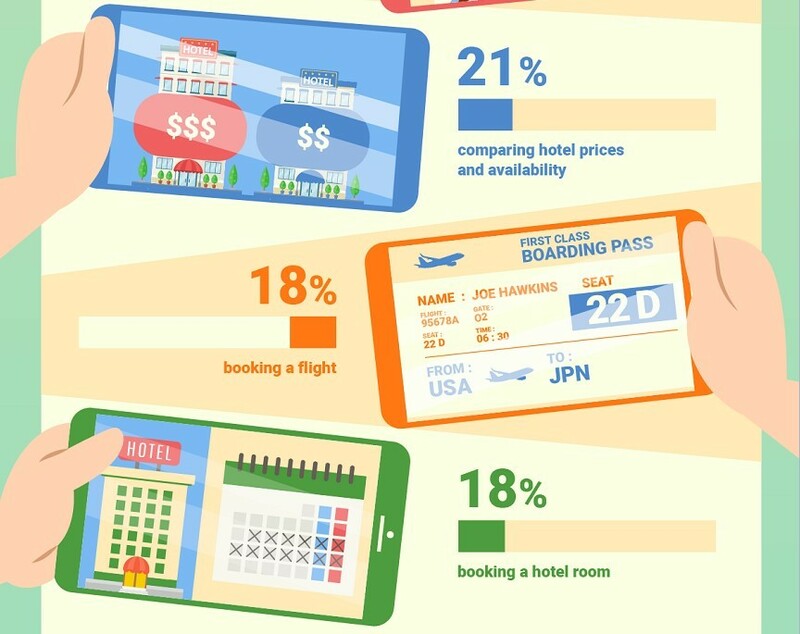 Given the impact mobile technology has had on the travel industry, it’s time for your travel brand to consider hopping on the mobile bandwagon if you aren’t already on board. Is social media part of your vacation plan? Are you a travel marketer that uses social media to reach customers? What strategies do you use to inspire travel plans? Or maybe you’re a traveler who just booked your next trip thanks to social media. Let me know in the comments below! Don’t forget to share this infographic, and subscribe to Marketing Manager Insider for more helpful tips. 4 Remarketing Best Practices	SEO FAQ: How Long Should Content Be?